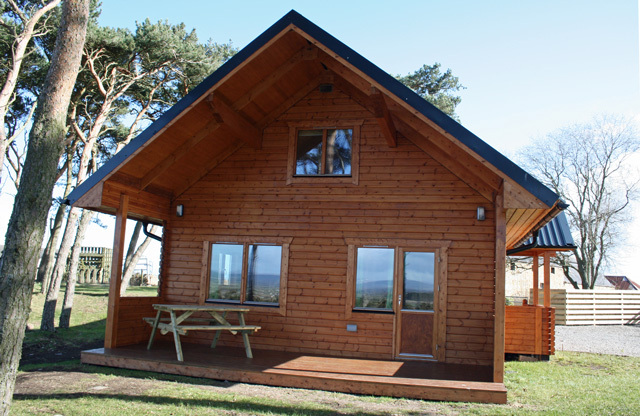 Taigh Fiodha (Gaelic for wooden house) is located in a wooded setting just a short walk from the villages of Shandwick, Balintore & Hilton. 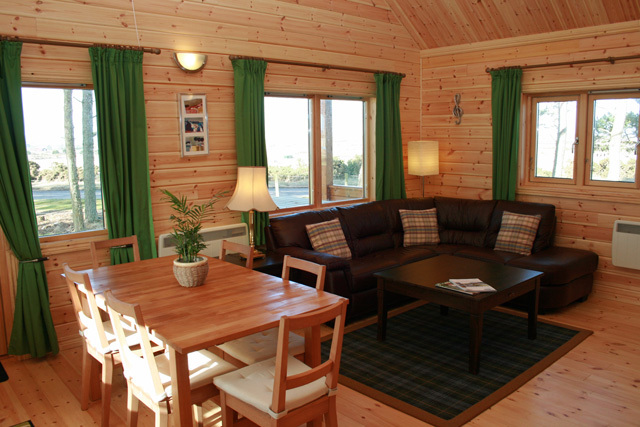 The recently completed property has been equipped and furnished to a high level, and would make an ideal base for visiting this part of Scotland, or for those wanting to experience the northern highlands or even visit the Orkney Islands. 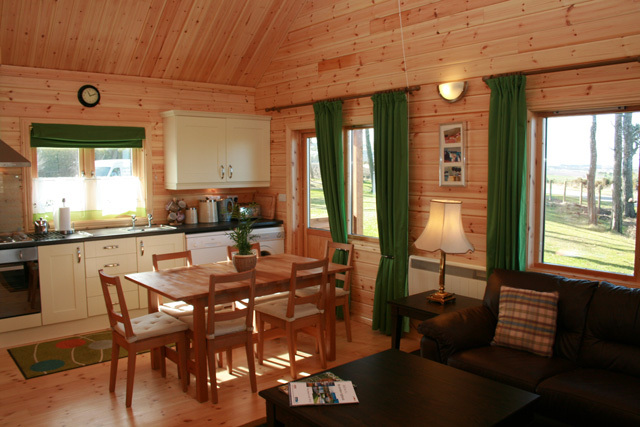 The property made from Scandinavian pine logs consists of a spacious double height open plan lounge, kitchen, and dining area, from here direct access is obtained to the decked veranda area with its picnic table, an ideal place to relax and sit at the end of the day and reflect on the days adventures. 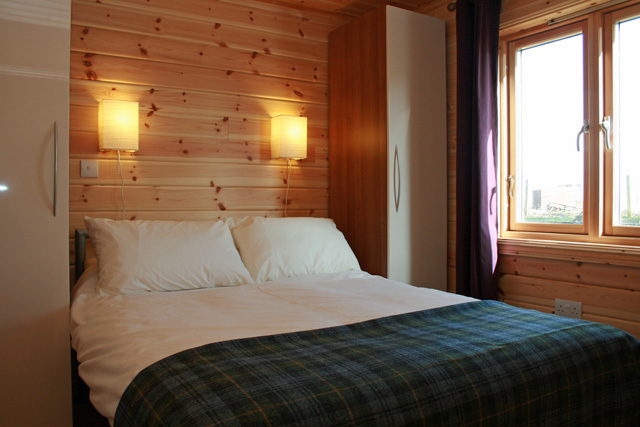 Further accommodation downstairs consists of a double bedroom, bunk room, and a spacious bathroom with a large walk in shower. From the lounge a wooden staircase leads to the galleried bedroom, which can either be made up as a twin or a king bedroom. The surrounding area has evidence of settlement since 780AD. Just a short walk from the property you will find the Shandwick Stone or the Clach a’ Charridh, the stone standing at 2.7 metres high, is decorated with carvings of Pictish symbols and a Christian Cross. The position of the stone, offers excellent views along the coast to the north. Further inland you will find Fearn Abbey founded in 1238. 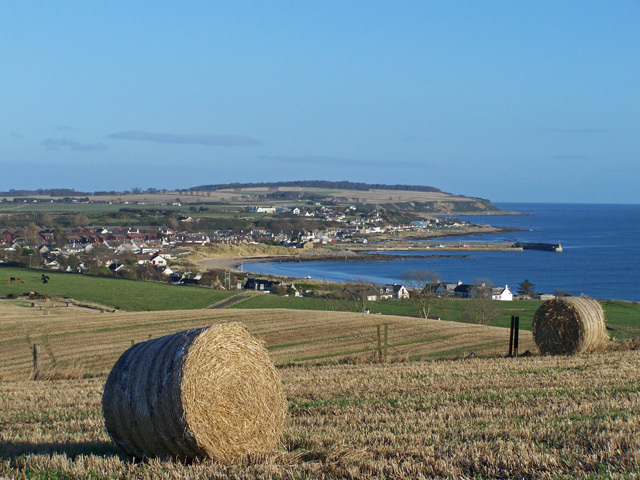 The small villages in the vicinity are often referred to as the “Seaboard Villages” the villages with their sandy beaches merge into one, following the line of the coast with the harbour at Balintore at its centre, an ideal spot to do a bit of fishing. Close to the property you’ll find the ANTA ceramic and fabric outlet together with its small coffee shop. The selection of bags, ladies and gents clothing and soft furnishings are made from the finest of fabrics including tweed, all of which are manufactured in Scotland. The brightly coloured ceramics many with a tartan theme would make an ideal gift or keepsake. 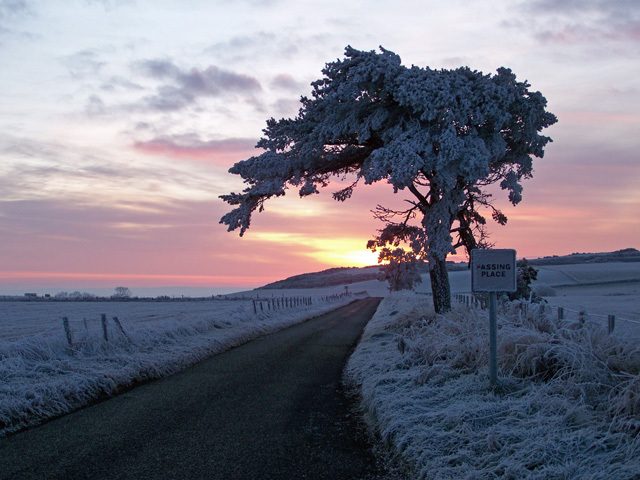 A short drive will bring you to Nigg, on the northern side of the Cromarty Firth, from here the Cromarty Ferry operates from June to the end of September, allowing visitors the chance to reach the Black Isle and the picturesque village of Cromarty. The ferry one of the smallest in Great Britain runs frequently during the day, and as the route is very short you’ll not have long to wait for the next one. Cromarty is often referred to as the highland’s best preserved historic town. Whilst here why not visit the Cromarty Courthouse and its award winning museum, highlighting the past and present within the area. Birdwatchers would not be disappointed in this location, with the closest RSPB reserve at Nigg Bay, which is regarded as one of the best places for wildlife in the UK. The vast mudflats are home to an impressive array of birds and fauna. Further north Forsinard Flows, near the town of Thurso is also worthy of a visit. One of the best times to visit would be during the summer months when many of the resident birds are breeding. The nearby town of Tain, the oldest Royal Burgh of Scotland, has a good selection of small shops, cafes, Tain Pottery, and the Glenmorangie Distillery and Visitor Centre. The visitor centre here will explain about the manufacturing process of making whisky and allow you to sample some of Scotland’s “water of life”. Glenmorangie is one of the best and most famous of Scotland’s malts, and is exported worldwide. Further afield the pretty town of Dornoch is certainly worth a visit, the town with its large cathedral became the centre of attention of the world’s media when the cathedral and nearby Skibo Castle became the venues for the popstar Madonna’s wedding. The town is also home to the world class Royal Dornoch Golf Club, and a selection of interesting shops and restaurants. A short drive north of the town (15 minutes) you’ll reach Dunrobin Castle, home to the Dukes of Sutherland. The castle the most northerly of Scotland’s great houses, is also the largest in the northern highlands with 189 rooms. The castle resembling a French chateau with its fairytale spires and turrets is open to the public from the April through to mid October. The magnificent gardens are believed to have been inspired by the Palace of Versailles in Paris, their formal layout which has changed little over the last 150 years, includes large pools with fountains and a varied selection of flowers and plants. The ferry port at Gills bay near Wick is within a two hour drive, from here you can take the boat to the Orkney Islands, the boat trip takes one hour, en route you’ll have the opportunity to look out for the resident sealife, basking sharks, dolphins, orca and porpoises. Reaching the islands the many sea cliffs are home to a large number of seabirds, look out for the gannets and puffins. The final destination is St Margaret’s Hope, from here a twenty minute drive will take you to mainland Orkney. Whilst here places worth visiting include the, Italian Chapel, Skarra Brae, St Magnus Cathedral in Kirkwall and the Churchill Barriers. The large entrance hall has plenty of room for outdoor clothes and shoes. Light and spacious open plan lounge/kitchen with lovely views West to Ben Wyvis and North to the hills and mountains of East Sutherland. Lounge with leather corner sofa. Freeview TV with DVD. CD player and radio. A selection of DVDs, books and games. Door leading to outside veranda with picnic table, ideal for alfresco dining or just relaxing after a day’s sight seeing. Barbecue available. The fully fitted kitchen has an electric oven and hob, microwave, fridge with freezer compartment, dishwasher and washing machine. 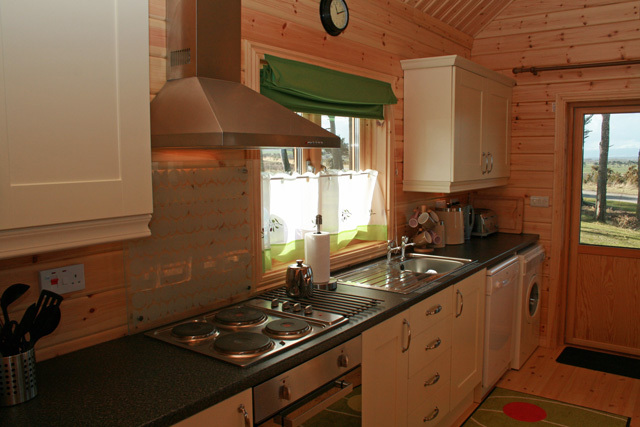 Usual kitchen appliances available, plus ironing and indoor and outdoor drying facilities. 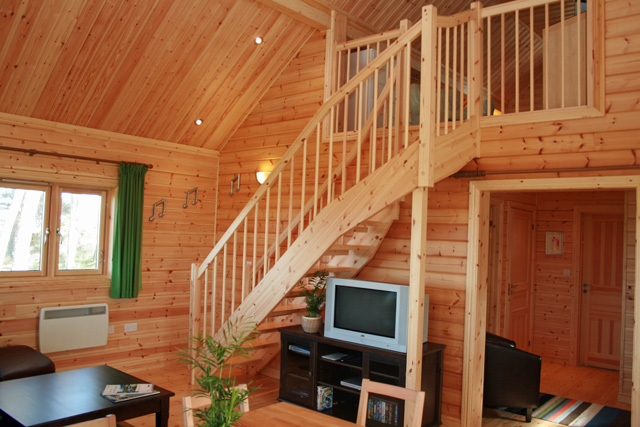 Stairs leading from the lounge to the upstairs gallery bedroom, which is fitted with twin beds which can be zip and linked to make a large king size bed. Hair dryer. 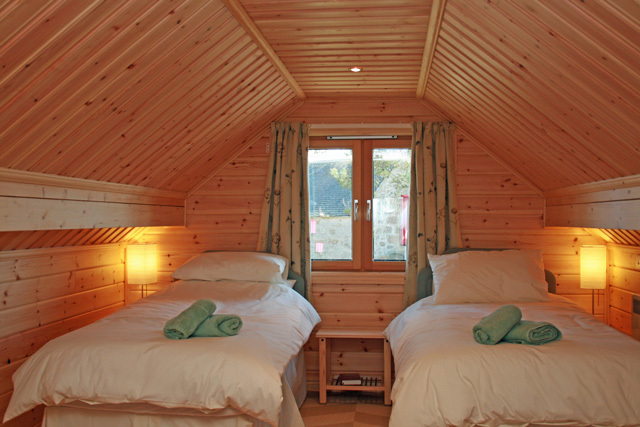 Two bedrooms downstairs – Double and bunk room. Bathroom with walk-in shower whb and wc. Heated towel rail. Electricity for lights and appliances. 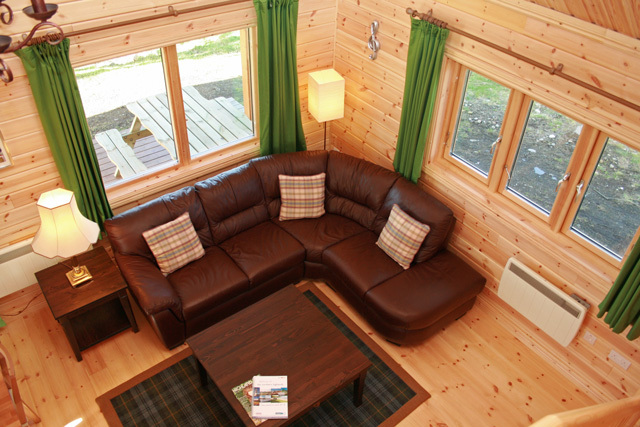 Heating is provided by electric panel heaters which run from a separate meter, included in the price is an initial supply of £10.00 per week, thereafter by £1 coin. One well behaved dog allowed, please note the garden area is not secure. Please note: Due to the location mobile coverage may be limited or even unavailable. FANTASTIC PLACE TO STAY, SUPER PROPERTY ONE OF THE BEST THAT WE HAVE VISITED AND IN A BEAUTIFUL CORNER OF THE COUNTRY. THE PHOTOGRAPHS DO NOT DO JUSTICE TO THE SIZE OF THIS PROPERTY OR TO THE SIZE OF THE SITE. DEFINATELY ONE PLACE WE WILL RETURN TO. 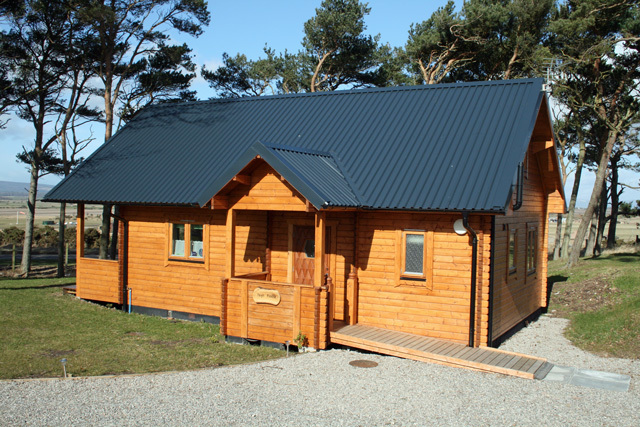 The cabin was very comfortable and well equipped and the Jackson family made us very welcome but were not at all intrusive. The beach at Shandwick Bay is beautiful, within walking distance and usually deserted - perfect for long dog walks. It's a great location to tour the North Highlands which is stunning! Didn't find much in the way of pubs or restaurants to get excited about but there is an excellent fishmonger / butcher / local food supplier in Tain.